While STS-125 continues to enjoy a successful Hubble servicing mission – marked by a hugely successful third spacewalk – Endeavour has progressed to a standby point for her STS-400 LON (Launch On Need) role, which is expected to be stood down after the Damage Assessment Team (DAT) evaluation of Late Inspection data near the end of Atlantis’ mission. The unique rescue mission was designed due to the unavailability of the International Space Station (ISS) as a ‘safe haven’ for the STS-125 crew in the event of serious damage being found on the orbiter. Following a successful launch and clearance of Atlantis’ Thermal Protection System (TPS) for re-entry, it would take a freak incident – such as a major MMOD strike – to cause managers to place Endeavour into a launch pose. However, that’s exactly what Endeavour has been working towards over the past few weeks, allowing for a rescue mission to be launched within days – should a major problem be found during Late Inspections. “STS-400 LON S0007 Launch Countdown pre-ops continue,” noted Endeavour’s processing flow at Pad 39B via L2. “S1287 Orbiter Aft Closeout continues. 50-1/2 door installation and Aft confidence test is scheduled for Friday. Endeavour will hold at this point of her flow, pending a Mission Management Team (MMT) decision to either proceed or standdown from the STS-400 requirement next week. In the highly unlikely event STS-400 was required to launch and rescue the STS-125 crew, Endeavour’s main propulsion systems would be pressurized for flight, before heading into S0007 Launch Countdown operations on Wednesday. “STS-400 Late LON-Launch (5/23/09) Ops – Execution by MMT direction only: CTS (Call To Stations) for S0071, Hyper/MPS (Main Propulsion System) Pressurization for Flight is scheduled for 0530L on Monday 5/18,” added the STS-400 processing flow. Following the expected STS-400 standdown, Endeavour will be prepared for her rollover to Pad 39A – ahead of her primary STS-127 mission to the ISS, currently scheduled for a June 13 launch date. Following Flight Day 5’s lengthy spacewalk – which was the 8th longest EVA in history – Mission specialists John Grunsfeld (EV1) and Drew Feustel (EV2) are conducting several highly complex tasks on EVA-3. “COS: EV2 rides over to the –V2 aft shroud door to open the doors. They both perform removal of the old COSTAR instrument and EV2 takes it over to the ORUC (Orbital Replacement Unit Carrier) for temp stow,” noted the flight plan overview. “They retrieve COS from the ASIPE (Axial Scientific Instrument Protection Enclosure) and close the ASIPE lid. “They head over to the –V2 aft shroud location, where EV2 (on the Remote Manipulator System) inserts COS into place. EV1 will mate the 4 connectors pins and install the harness that had been used to keep COSTAR in place. UPDATE: This task has been completed successfully. 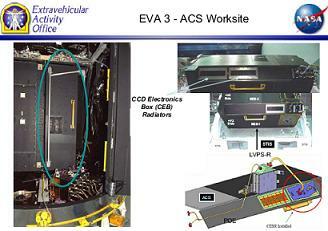 The second big task of EVA-3 relates to the repair of the Advanced Camera for Surveys (ACS) – which suffered from an anomaly that occurred on January 27, 2007. The repair will see the replacement of the CCD electronics box (CEB) in the ACS’s Wide Field Channel (WFC). The replacement CEB will be powered by a replacement LVPS (low-voltage power supply), completely independent of the failed unit. The replacement CEB will communicate with the WFC CCD – as well as with the rest of the instrument for command and data- via the edge connectors in the original CEB. The replacement LVPS draws power from the ACS primary power connectors, accessed via a splitter cable installed by the spacewalkers. “ACS-Part I: Both crew perform this activity pretty much together. At the –V2 location, the crew removes fasteners from the ACS WFC CCD Electronics Box CEB and installs four guide studs into the fastener holes,” added the flight plan walkthrough. “They then retrieve and install the grid cutter and ground strap from the New ORU Protective Enclosure NOPE (New ORU Protective Enclosure). Then they cut the grid and remove the grid and the cutter and restow in the NOPE. “They retrieve and install the ACS Fastener Capture Plate on the guide studs. This allows the crew to remove 32 fasteners and the CEB cover from the ACS so they can access the electronic cards 1 and 2, which will be removed and stowed into a card stowage module. With Part I completed well ahead of the timeline, the spacewalk utilized available time to enter a second phase of ACS repairs. 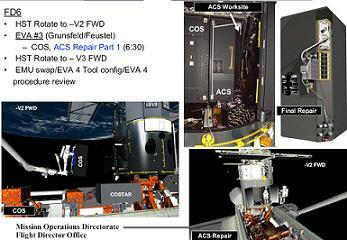 “ACS-Part II: If time permits in this EVA, the crew will proceed with completing ACS install. Otherwise, it will not be completed unless the STIS (Space Telescope Imaging Spectrograph) repair was unsuccessful. In that situation, ACS will be completed on EVA-5. “However, if the crew is pressing on, they will now remove cards 3 and 4. Then they will retrieve the CEB replacement module and the Low Voltage Power Supply (LVPS) from the Large ORU Protective Enclosure (LOPE). The CEB module will be installed on the ACS and the new LVPS will be mounted to the ACS handhold. Part II was also completed well ahead of schedule, with the EVA then moving into clean-up activities, before the spacewalk was concluded after six hours and 36 minutes.